Limited-Edition AG40 Honours Industry Identity - Concept Caravans | Innovative and stylish Australian made caravans. In celebration of industry identity Alan Graham’s 40 years of success, Concept Caravans has announced the Limited-Edition Concept AG40. Alan Graham Caravans and RVs at North Gosford in the heart of the NSW Central coast became Concept’s 5th dealer in April 2005 and today, is the brand’s largest retailer. The Limited-Edition Concept AG40, features a unique livery and interior layout including two-tone gloss stylite cupboard doors, an ensuite mirror with LED touch lighting, a full-height shower cubicle, black tapware, large kitchen drawers, pull-out footrests, a three-burner Swift oven with electric hotplate and Vegas microfiber seating. The Concept AG40 rides on a six-inch A-frame pearl white cladding, alloy wheels with distinctive black composite side and rear panels. There is plenty of storage options in the Concept AG40 including front and side ¾ tunnel boot as well as a black checkerplate front boot. Cars played a big part in Alan’s early business life, with his father owning Grawill Motors, the Gosford Ford dealership, which Alan joined in 1959, as the accountant. It wasn’t long before the business was in his blood and Alan was soon appointed the Sales and General Manager, which saw him effectively run the business. After successfully operating the Ford dealership, Alan saw an opportunity in the leisure and caravan market, and from there, in 1977, Alan Graham Caravans and RVs was born, retailing caravans, RVs and cars. “Our Reputation is Your Protection”, and while Alan and his wife Judy are actively involved in the family business, the day-to-day running is now managed by their son Andy, who shares his parent’s passion for caravan holidays and adventures. Alan’s Service Manager, Steven Fuller is like family, having been with him since 1976. 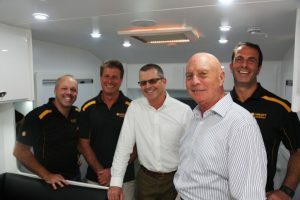 Concept Caravans Director, Keir Smith said, “We thought it fitting to create a limited-edition caravan for Alan, who is a visionary of the industry and to celebrate 40 successful years in business”. On hearing of Concept Caravan’s Alan Graham said: Our relationship with Concept Caravans is based on mutual respect. We value their commitment to the Caravan Industry and our dealership. The AG40 is an excellent package for the consumer, we thank Keir Smith and his team for producing such a stunning Anniversary model. 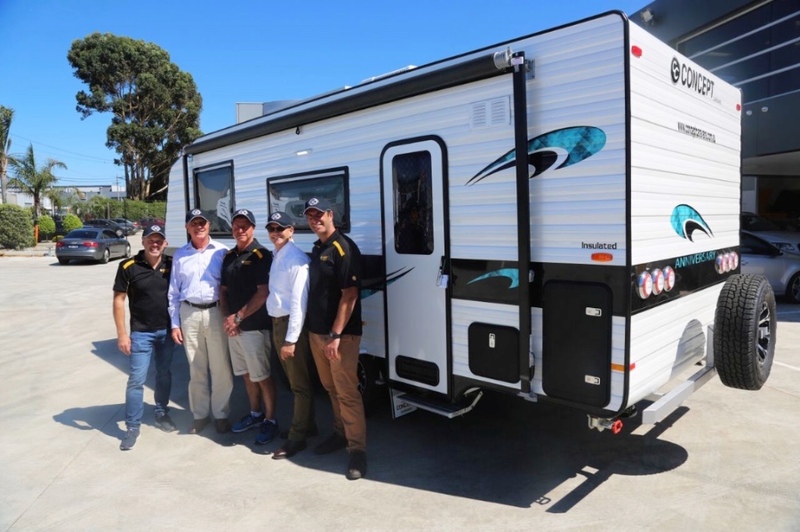 The Limited-Edition Concept AG40 will take centre stage at the Sydney Caravan, Holiday and Camping Supershow at Rosehill Racecourse, April 25 to 30.